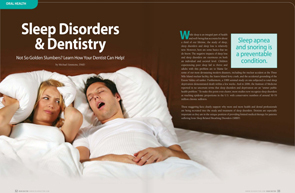 What causes snoring and who is at risk? Snoring occurs when air does not flow smoothly through the air passages, or when the soft tissues or muscles in your air passages vibrate. As you fall into a deep sleep, the muscles in your tongue, throat and roof of your mouth (soft palate) relax. This muscle relaxation causes your throat tissues to sag. As you breathe, the sagging tissues narrow your airway and vibrate or flutter, creating the sound of snoring. The narrower your airway becomes, the greater the vibration...and the louder your snoring. Snoring affects 45 per cent of the population from time to time and an estimated 25 per cent of people are habitual snorers. There are a number of reasons why you may snore. Age can be a factor. The older you get, the weaker your throat muscles become. Weak throat muscles cause the surrounding tissues to sag and vibrate. If you are overweight, your throat tissues are less firm and more inclined to vibrate when you breathe. A low-set, thick soft palate, or enlarged tonsils or adenoids (the spongy tissue between the back of the nose and throat) can narrow your airway. A longer-than-normal uvula (the triangular piece of skin that hangs from your soft palate) can limit airflow and increase vibrations as you breathe. Nasal blockages caused by allergies or a deviated septum (when the partition between your nose is crooked) can limit airflow through your nose. This forces you to breathe through your mouth where more flabby tissue is located. Alcohol and certain drugs (such as tranquillizers) affect your central nervous system, causing extreme relaxation of your muscles, including those in your throat. When you sleep on your back, your tongue falls backwards into your throat which can narrow your airway and partly block airflow. When does snoring indicate a more serious problem? Rarely, snoring can indicate a more serious problem. If you snore loudly with occasional pauses in breathing, and you frequently wake up during the night, you may be suffering from sleep apnoea. Ask your partner, or a member of your family to listen for signs of this disorder. Sleep apnoea is periods when you stop breathing while you're sleeping. These interruptions in your breathing, which can last 10 seconds or longer, occur when the muscles in your soft palate, uvula, tongue and tonsils relax during sleep. This is the same process involved with normal snoring, but with sleep apnoea, the airway narrows so much that it closes. Your breathing stops, cutting off the flow of oxygen into your body and reducing the elimination of carbon dioxide (CO2) from the blood. Your brain detects this rise in CO2 and briefly wakes you up, re-opening your airways and re-starting your breathing. This process can be repeated several times during the night. Proper sleep may become impossible, resulting in severe fatigue and a decreased quality of life. Sleep apnoea in adults can increase the risk of serious health problems such as heart failure, because it deprives the sufferer of adequate levels of oxygen, making the heart work harder than normal. 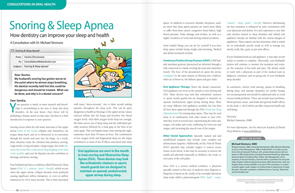 How do doctors recognize sleep apnoea? Visual observation of sleep, to detect laboured breathing, with long pauses, followed by arousal from sleep. Pulse oximetry, to measure the amount of oxygen in the blood and the pulse rate. The recording is taken for at least 8 hours overnight, and can be carried out at home. Multiple dips in oxygen level and peaks in pulse rate are found in people with sleep apnoea. Polysomnography, which involves many measures of sleep, including eye movements and chin tone to define sleep stages, flow of air through the nose and mouth, movement of the chest wall, oxygen levels in the blood, and ECG (electrocardiography) to measure any serious abnormal heart rhythms. 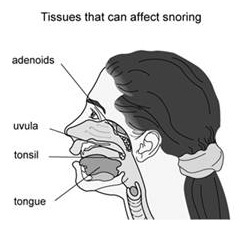 Some causes of snoring (listed above) are the result of lifestyle habits. By altering these habits, you can stop or at least minimize your snoring. You should aim to eat five servings of fresh, frozen or canned fruits and vegetables in your daily diet. You can also prepare meals in a more healthy way, for example baking or grilling foods instead of frying. This will not only reduce the fat in your throat tissues, but will also help improve your general health. Regular exercise will improve muscle strength. If you are starting out begin with a 10-minute period of light exercise and gradually build from there. When you are ready, it is recommended that you exercise at least three to four times a week. Try to do 20–30 minutes a session. Those 30 minutes don't have to be continuous: we know that three 10-minute sessions of exercise each day is just as good. Occasional vigorous activity is unwise and possibly dangerous if you are 'out of shape'. Keeping the body in alignment, which could include raising the head of the bed, may help reduce snoring. This should be done by raising the head of the bed itself or by making sure that your pillow is at the correct height. If you have allergies that cause nasal congestion, try an oral or spray decongestant available from your chemist. Be careful not to use these over-the-counter (OTC) products on a long-term basis. If your nasal congestion doesn't clear up in a few days, see your doctor as you may need stronger medication, or other measures to clear your nasal passages. If your nasal congestion is caused by a structural problem in the nose such as a deviated septum, there are surgical techniques that can correct it. If your doctor diagnoses sleep apnoea and none of the simple remedies are successful, he or she may recommend wearing an oxygen mask over your face while you sleep, to force air through your airway so that it won't close. 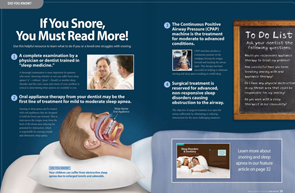 This treatment is called continuous positive airway pressure (CPAP). However, this form of treatment may need to continue for months or years and some people find wearing a mask in bed every night difficult to tolerate. While making lifestyle changes should be the first step in treating your snoring, these measures are not always effective. If that is the case, you might want to consider a form of surgery called laser-assisted uvulopalatoplasty (LAUP). This relatively new procedure has been found to stop or reduce snoring in most people. LAUP involves removal of excess tissue from your soft palate and uvula with a small, hand-held laser. The operation makes your airway larger, so vibrations are decreased. The procedure is performed under a local anaesthetic and takes about 30 minutes. Depending on the severity of your snoring, you may need more than one session – some people may need up to five or six sessions before their snoring is improved. If you need multiple treatments, they will likely be spaced four to six weeks apart. In general, this surgery does not have serious side effects and you can continue your regular activities immediately after the procedure. Some people may have a sore throat for about one week. In a very few cases, laser surgery can raise or lower the pitch of the voice. Before you decide on laser surgery, talk it over with your doctor. If your sleep apnoea is caused by a jaw deformity, an operation to correct the deformity (which usually involves lengthening of the jaw bone) will be performed. This is successful in most people. If no cause can be found for your sleep apnoea and it is not considered to be life-threatening, a procedure called uvulopalatopharyngoplasty (UPPP) can be performed, where a surgeon trims and tightens throat tissues while you are under a general anaesthetic. However, this procedure has only a 30-50% success rate and can affect your ability to have CPAP therapy at a later date. If your sleep apnoea is caused by large tonsils and/or adenoids, these can be removed in a simple operation called a tonsillectomy or adenoidectomy. Snoring is a mild annoyance for most people, but for those who snore habitually, it can cause serious social and marital discord. Usually, it can be remedied by lifestyle changes and/or surgery. Sleep apnoea is a more serious condition that can cause chronic illness if left untreated, but several effective treatment options are available.